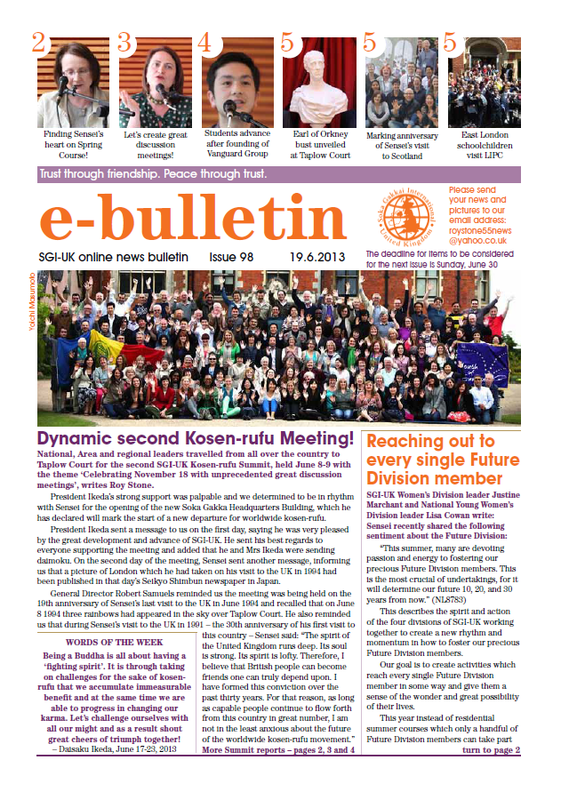 The Soka Gakkai Buddhists of Essex (and beyond) - united and online! Daily Practice - SGI-UK e-bulletin out now! 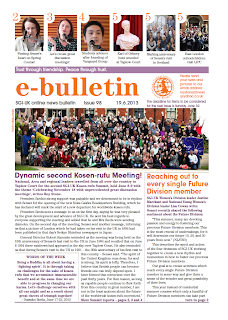 Sorry everyone, I'm late in posting this up - issue 96 of e-bulletin can be found here! Many congratulations on holding this European Women’s Division General Meeting in high spirits! My wife and I are chanting for the great success of the meeting and watching over you. We are imagining all of your cheerful smiles, as you gather together from your respective areas in Europe. Amid the harsh realities of an ever changing world, I am well aware of how much you are exerting yourselves, day in and day out, in your Buddhist activities in order to construct a peaceful society, for the prosperity of your local community and to establish happiness for yourselves and others. Thank you so much for your great efforts. There is no doubt that the heavenly deities will surely protect every one of you, who are tirelessly dedicating yourselves for kosen-rufu. How immense is the power of the Mystic Law! The Daishonin asserts that through continuing to chant resonant daimoku our lives will be polished and come to shine with brilliance, our environment will be transformed and we ourselves will be protected. Therefore, I sincerely hope that you will steadfastly walk on the correct path of faith, practice and study while encouraging one another. Shine as brilliantly as the sun in your family and steadily climb the slope of happiness everyday, one step after another. Putting your health first, please brightly and wisely demonstrate “actual proof of victory” in your local communities and your workplaces, and continue to expand the circle of trust in your environment. It is the cheerful advance towards happiness by the members of the Women’s Division that symbolises the hope-filled advance of the SGI. It is my fervent wish that all of you, without exception, will live an unsurpassed life where all your prayers and dreams come true. I conclude my message by expressing my heartfelt prayers for my beloved fellow members of the Women’s Division of SGI Europe. I am praying for your great health and success and the increasing happiness and prosperity of your families. Three cheers for the Women’s Division of Europe! Please stay well forever! Wonderful episode of Composing Hope here featuring beat-boxer Verbal Ase. Thank you SGI-USA for sharing!